Senior Leah Pascarella returns a serve. The University spends more on non-revenue generating sports, like women's tennis, than most schools in its conference, pouring $25 million overall into athletics in 2012. Behind the rapid serves and quick footwork that helped the men’s tennis team earn its third Atlantic 10 championship in four years Sunday is a funding plan that has increased the team’s budget by more than 220 percent since 2003. The team spent $496,841 two years ago on recruiting trips, coaches’ salaries and training programs – a quarter more than the next-largest men’s tennis budget in the conference, according to recent data made available by the Department of Education. While the success of GW athletics wavers across sports and years, one trend is clear: The University is putting more money into sports considered “non-revenue generating” than most in the conference. At the same time, funding for the men’s basketball team ranks fourth from the bottom of the A-10 in decade-long growth. Men’s basketball certainly makes the most money ($3.1 million in 2012) and attracts the most fans, but the financial strategy backs up rhetoric repeated by administrators that they want “each of our teams to have the resources that would allow them to be competitive within the conference,” athletics director Patrick Nero said in an interview. On average, GW sports have seen expenses grow more than 55 percent since 2003, mostly during the 17-year tenure of athletic director Jack Kvancz, who retired in 2011. That overall growth is nearly three times the rate of growth for men’s basketball. The biggest boost across the board, however, came with a $5 million jolt of funding in Nero’s first year – the year in which the University completed an athletics strategic plan. Overall, the University spent $25 million on athletics in 2012, about 2.6 percent of the University’s total operating budget. Many GW programs have taken advantage of growing money pot with standout years. For example, men’s water polo finished the year with its best record since the 2006-07 season and men’s rowing won the GW Invitational last week for the first time in the event’s history. Junior Madison Davis winds up to kick the ball. Funding sports more evenly has helped the department attract coaches. 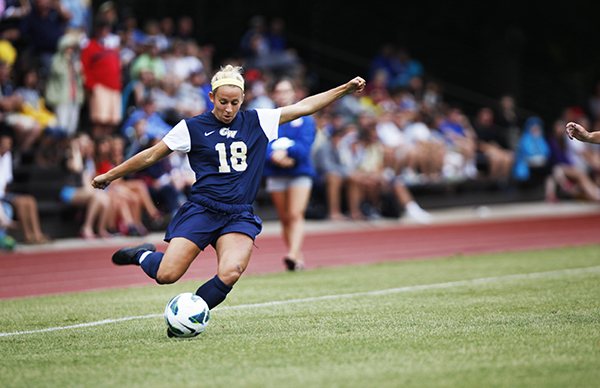 Women’s soccer head coach Sarah Barnes said she came to GW two years ago because it was “clear in the interview process” that the team would be well-supported by the University. “We continue to see a commitment to help all sports raise the bar,” Barnes said. Since she came, the department has given her 33-player team nutritional supplements and heart rate monitors that “allow our athletes to be trained at an elite level,” Barnes said. She added that increases to her recruiting and staff expense budgets have helped her get the program on the same “level as their conference competition,” with the Colonials celebrating their first winning season this year since 2003-2004. Nero said the department decides each team’s budget for the next year by comparing how GW’s team stacks up with the conference’s top teams. The team’s budget then grows more than the competitor in its coveted slot. The department also spends big when it wants to lure the right person to Foggy Bottom. For instance, GW’s Jonathan Tsipis is the highest paid of any A-10 women’s basketball head coach, while men’s basketball head coach Mike Lonergan is in the middle of the pack, Nero said. The department also doesn’t “compare volleyball to basketball” when deciding on where to allocate resources. He said the athletic department looked at the Dayton volleyball program, the most successful in the A-10. It devised a five-year plan to give GW the same funding as Dayton’s team by its completion. Current win-loss records and revenue brought in also aren’t chief factors in funding decisions, he added. 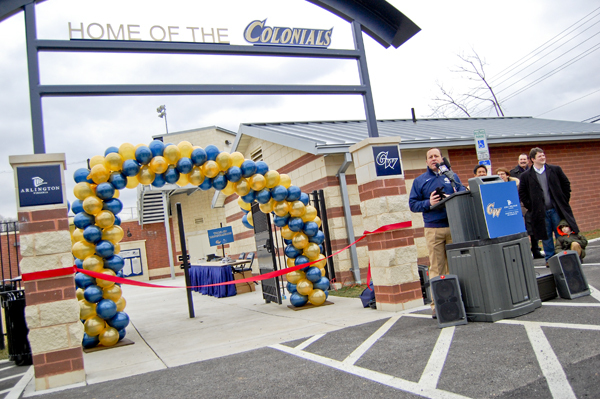 Athletics director Patrick Nero speaks at the official unveiling of the renovated Barcroft Park in Arlington, Va. last March. The renovations cost about $3 million be helped propel a recruiting boon for the program this year. Nero, who has been at GW since 2011, oversaw the release of the athletic department’s strategic plan, which will guide the University’s funding strategy for athletics through 2016. That document looked to set GW’s athletics department on a path to catapult it from near the bottom of the conference in overall funding to the upper tier. Those costs, committed by the University but allocated under the athletics department budget, helped fund investments in facilities like those at the Smith Center, the construction of new tennis courts, the 2011 renovations of Barcroft Park and the soccer and lacrosse turf field on the Mount Vernon Campus. “When student athletes come visit GW, we no longer don’t show them facilities,” Nero said. But despite the growth, some teams still struggle. Baseball sits at 13-23 and, despite making the postseason for the first time in seven years last season, hasn’t finished a season with a winning record since 2005. 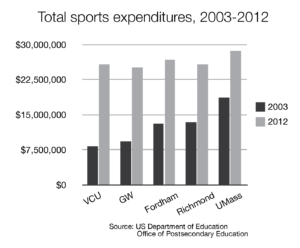 Overall, VCU, Massachusetts and Fordham outspent GW in athletics in 2012, with Massachusetts clocking in with top dollar at nearly $28.7 million. 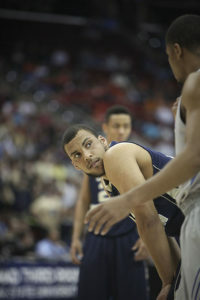 GW grew the men’s basketball budget 20 percent between 2003 and 2012 to about $3.1 million. Just 105 miles away, VCU has grown the men’s basketball budget by 340 percent since 2003, now totaling more than $5.1 million annually. Kevin Larsen waits for a teammate to shoot a free throw. Six A-10 schools, including GW, sent teams to the NCAA tournament in March. Of those teams, GW has added the most money to the budgets of men’s and women’s squash, men’s golf, men’s and women’s tennis, women’s soccer, men’s and women’s rowing and men’s and women’s water polo since 2003. Still, as the athletic strategic plan enters its third year – and the University announces a massive fundraising campaign – men’s basketball could see the growth of its budget catch up to its competitors. Nero added that keeping the success going for men’s basketball is critical because “success in men’s basketball does define you to the rest of the conference.” That exposure is critical as the athletics department’s fundraisers try to double the amount of donations over the next three years to $2 million. “When you’re not spending millions and millions of dollars on coaching and recruiting [for major sports] then it’s definitely easier,” Cooper said.